We met via the dating app, Tinder; neither of us expected it to end in marriage. 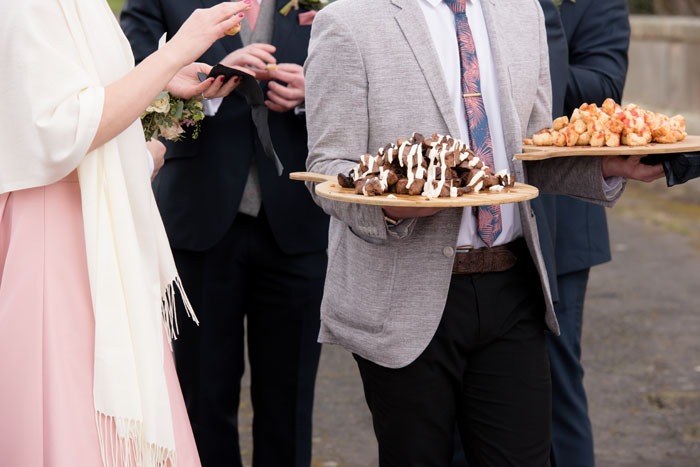 Our first date was in a Mexican restaurant where I was too nervous to eat my fajitas and Tim had major food envy after only ordering just a sandwich. Tim then went off travelling around America for two weeks but Facetimed me every single day. Our second date was the day he came back, straight after a 12 hour flight... it must have been love. The proposal was simple but perfect and a complete surprise. We had been out for dinner that evening and when we got home Tim lit some candles and we went to sit out in the garden. Tim suddenly appeared with this bottle of beer which is not unusual (Tim is a huge craft beer fan), but instead of drinking it he placed it down in front me. It said ‘I love you, will you marry me?’ on the label. Before I knew it he had a ring and was down on one knee. I was so surprised that I don’t think I was able to speak for a good few minutes and I even told him to put the ring away. Of course I was actually thrilled and said yes. Thank goodness is wasn’t the big public propose I thought I had always wanted. 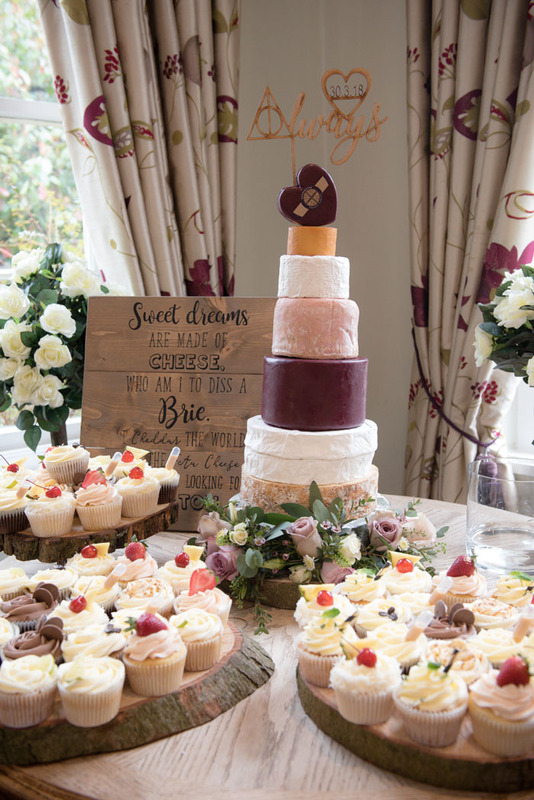 We had a vintage and personal themed wedding in the middle of the beautiful Shropshire countryside. 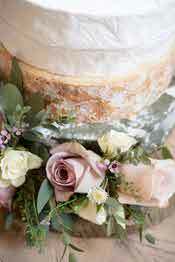 To reflect the beauty of the local area there were lots of rustic touches and flowers. Our colour scheme was dusky pink, sage and lavender, all natural colours for a spring wedding. 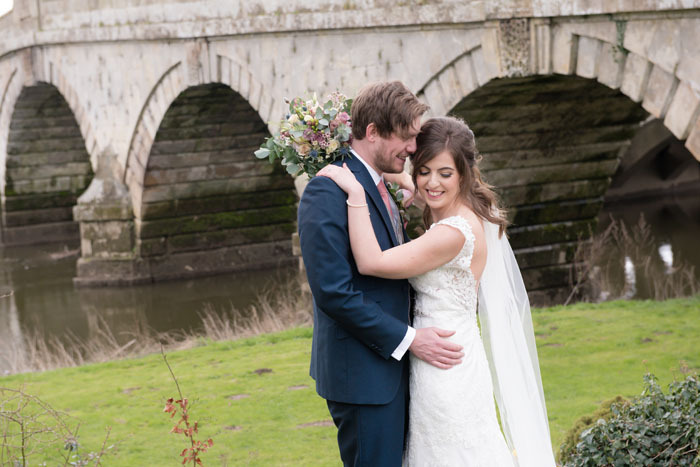 We immediately knew that we wanted to be married at The Mytton and Mermaid Hotel in Atcham after having driven past it many times before. 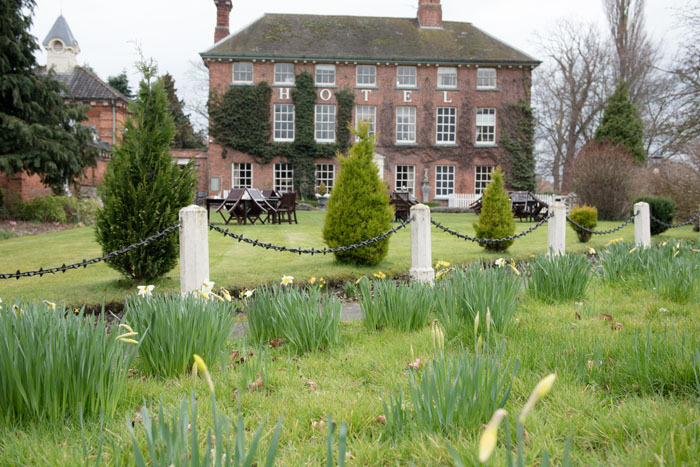 It’s a stunning Grade II original coaching inn set on the banks of the River Severn and it looks as though it has not changed over time. 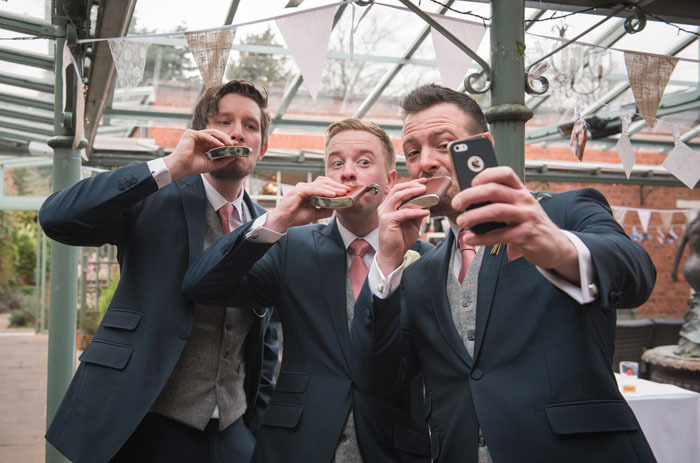 We knew that it would fit our vintage theme perfectly and the red brickwork would make a fantastic backdrop for photographs. 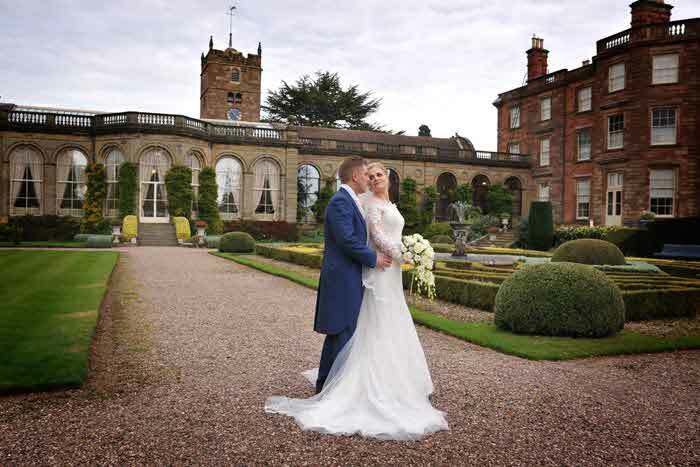 An added bonus was that it was directly opposite the imposing gates to the famous Attingham Park, somewhere that we often go for walks together. My wedding dress was the second dress that I tried on and I just knew that it was the one for me. 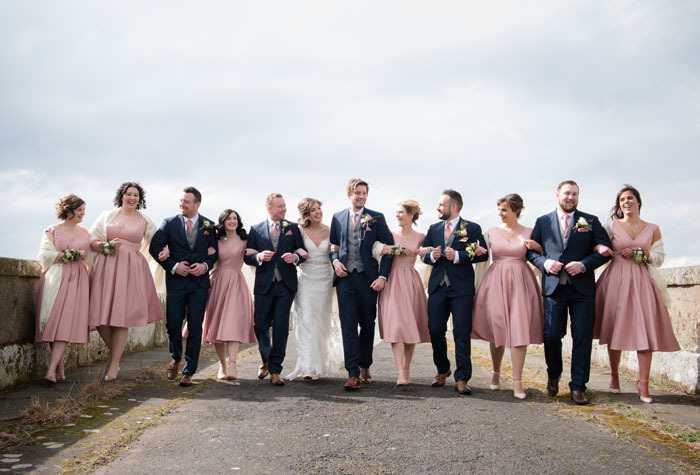 I wanted a classic, vintage style dress that also made a bold statement and I definitely found it. I didn’t know what my dress was going to look like until I started looking on the rails in shops, but I quickly discovered that I wanted to stay away from beading and sparkle. 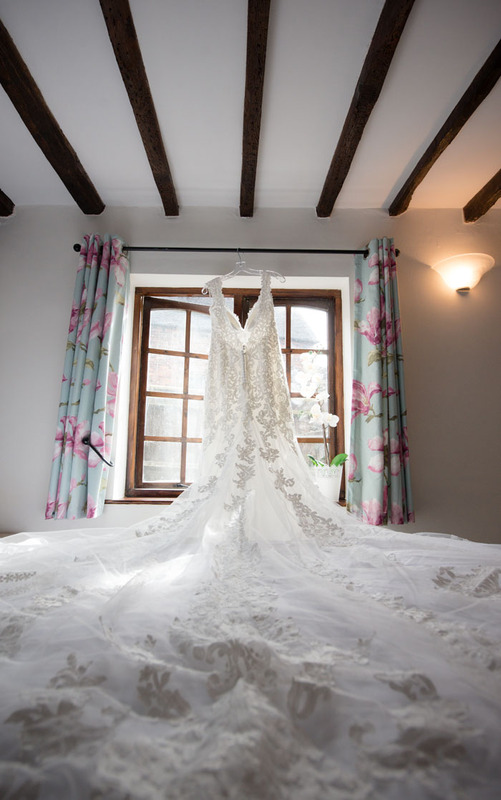 The dress I chose was designed by Essense of Australia and I fell in love with the lace, so much so that this lace became incorporated into many parts of our wedding. 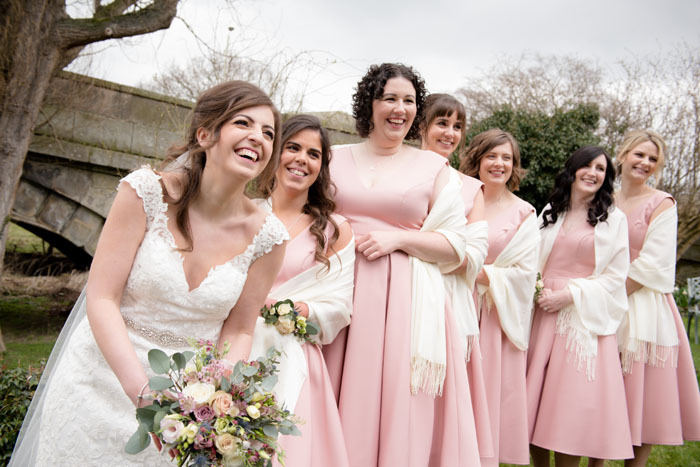 It was an elegant ivory, fitted dress that had an almost Jane Austin feel about it until you looked at the back… It was backless with a jaw-dropping lace train; I loved it. 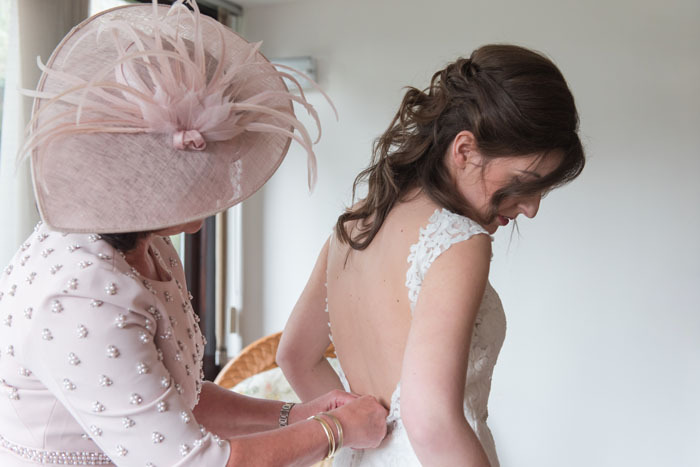 My mum had been adamant that she wasn’t going to cry during the wedding dress shopping process but when pulling out that train with a full length veil in tow, she certainly did. 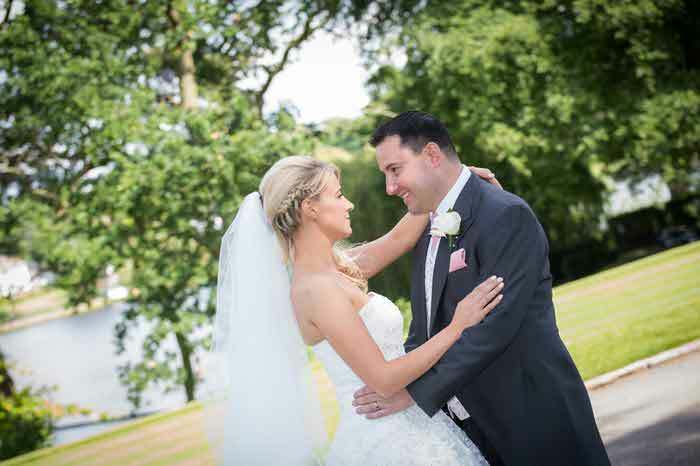 I chose my dress from a local boutique called White Rose Bridal in Stafford. My shoes were from London designer Harriet Wilde. They were a soft, barely pink leather. 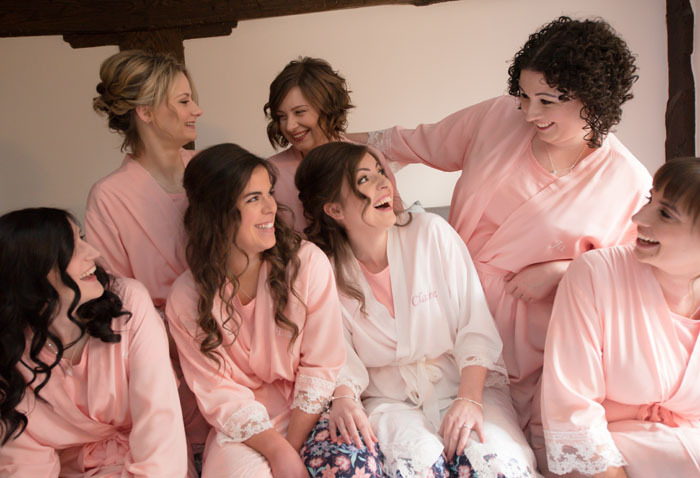 I had six bridesmaids: my sister, Ellie; Tim’s sister, Becky; and four of my closest friends. They wore v-neck midi dresses in pink from Chi Chi London. These also featured a low back to tie in with my dress and were paired with a full skirt to give the vintage feel. These dresses were fantastic because they suited a range of different body shapes and sizes. The bridesmaids wore flower corsages and matching necklaces with their initial and rose quartz. They also each had an ivory pashmina as we knew how unpredictable the weather could be in March. 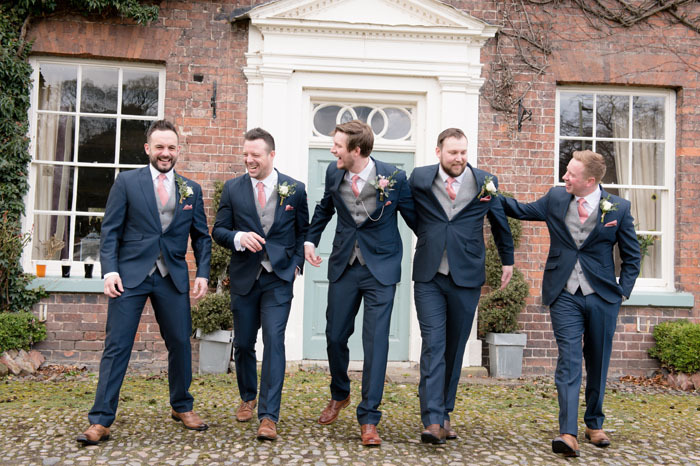 The groom, his four groomsmen and my dad all wore suits hired from Peter Posh. They were navy and had a tweed waistcoat underneath. The waistcoast was grey with pink accents. We wanted flowers to feature heavily in the wedding. 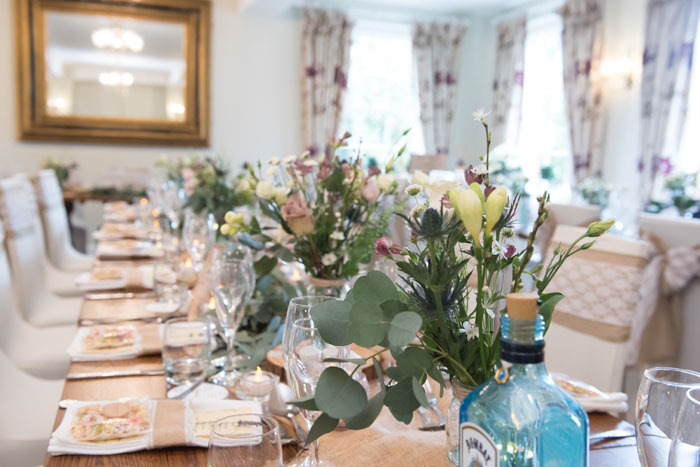 The venue had this great vintage vibe so we wanted to choose flowers to complement it and tie in with the surrounding Shropshire countryside. We were lucky to have Rebecca Rees arranging our flowers who is a frequent contributor to the Shrewsbury Flower Show and she brought our ideas to life perfectly. The long tables in the reception were unclothed to show the natural wood and featured eucalyptus garlands entwined with natural hessian. There were also glass jars filled with wild looking flowers that showed different tones of pink including memory lane roses and even thistles. 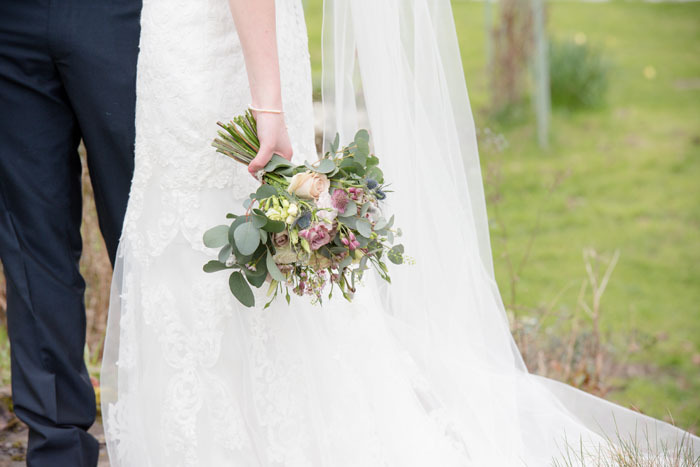 My bouquet was loosely tied with lace, overflowing with eucalyptus and fragrant. The bridesmaids wore flower corsages tied with ivory ribbon and the groomsmen had buttonholes featuring white roses. Tim had a pink memory lane rose in his corsage to match my bouquet. We also had a garland around our seating plan and smaller arrangements in the ceremony room to act as pew ends. The table where we signed the marriage register was covered in flowers. 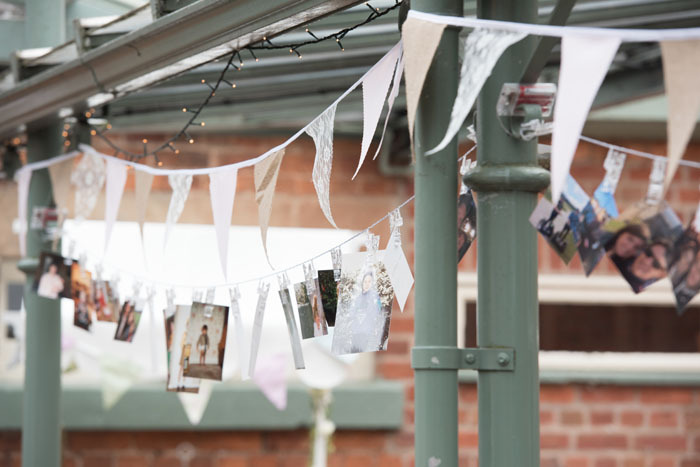 The courtyard was decorated to show it was a celebration with hessian, lace and pink bunting to pick up on Claire’s dress and the bridesmaids' dresses. Hanging all around the room were fairy lights on which we had pegged a multitude of Polaroid style photographs. 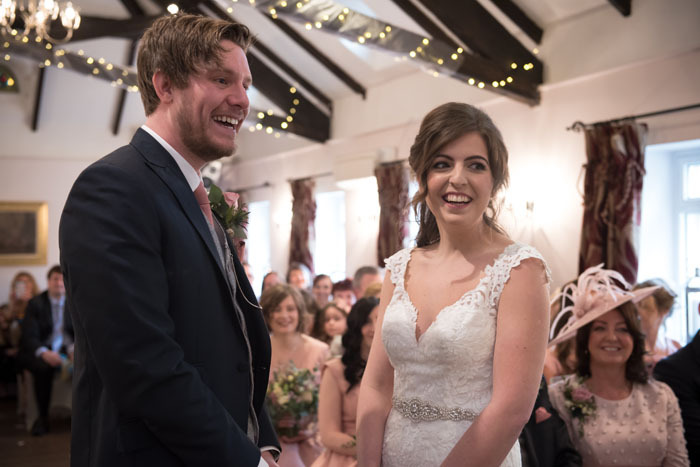 These photos were not only a timeline of our relationship but also photographs from our childhood and of the people that we love including special wedding guests. 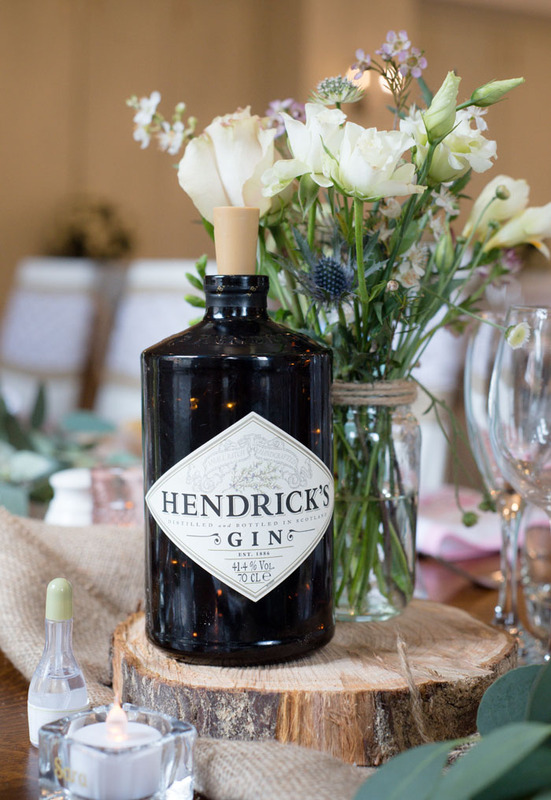 Our gin themed tables were identified by handmade centrepieces featuring gin bottles from our cupboard at home (there was lots of gin drinking in preparation) and these were rested upon rustic log slices, surrounded by jars of our favourite flowers. 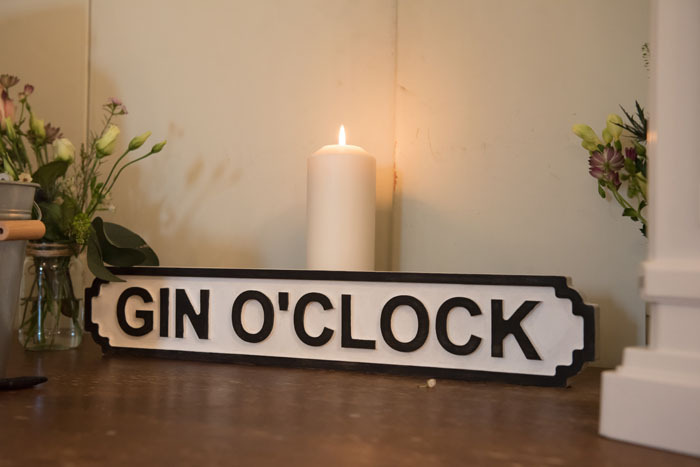 Place settings were made from class tealight holders with the guests' names on them and flickering candles. The wedding menu was printed at home on textured paper and wrapped in hessian and lace with a piece of calming lavender resting on top. 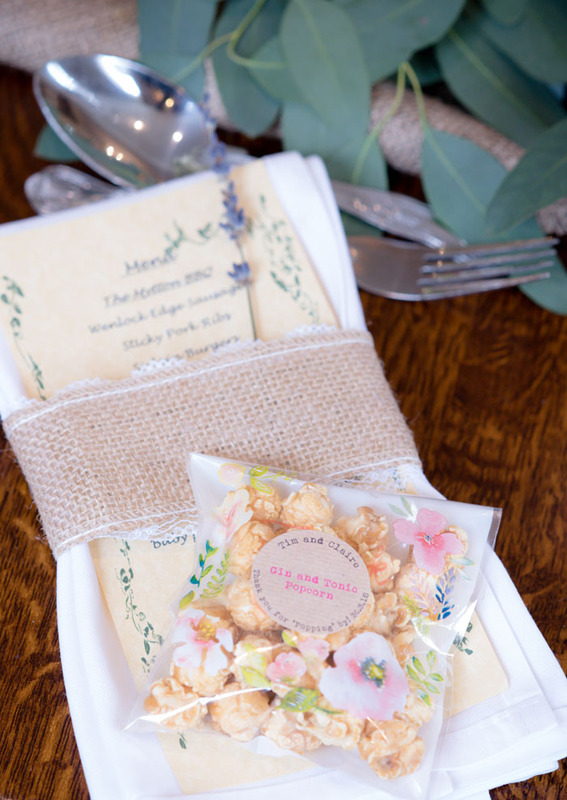 For favours, the guests were treated to gin and tonic popcorn wrapped in small floral bags. 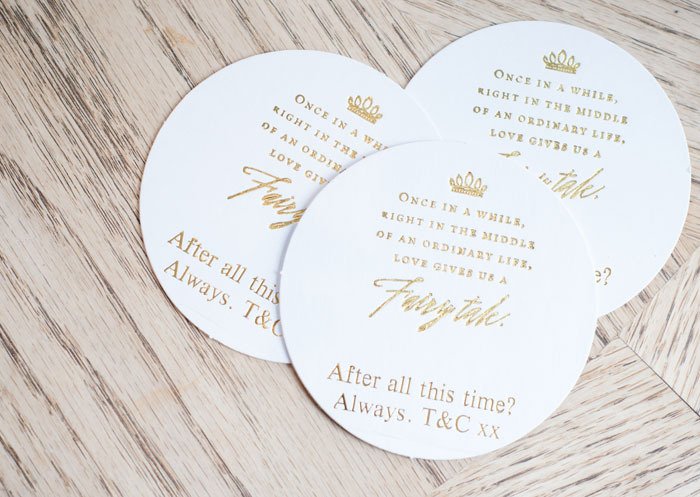 On the tables were also coasters printed with reference to fairytales, a small nod to our teaching background. 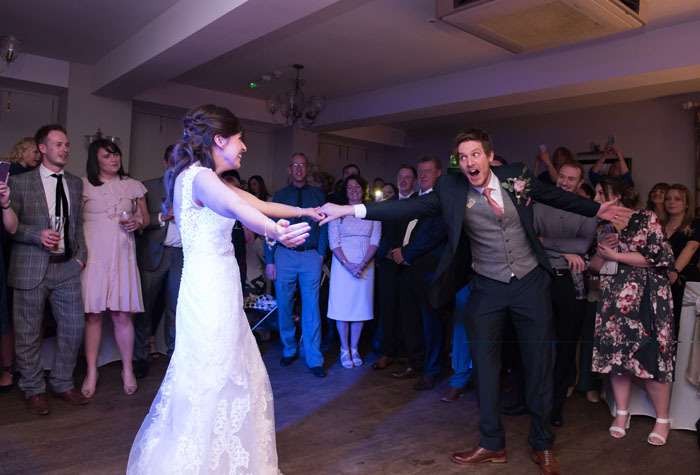 The relaxed vibe at the wedding was very important to us, so we decided to diverge from some of the traditional formalities. 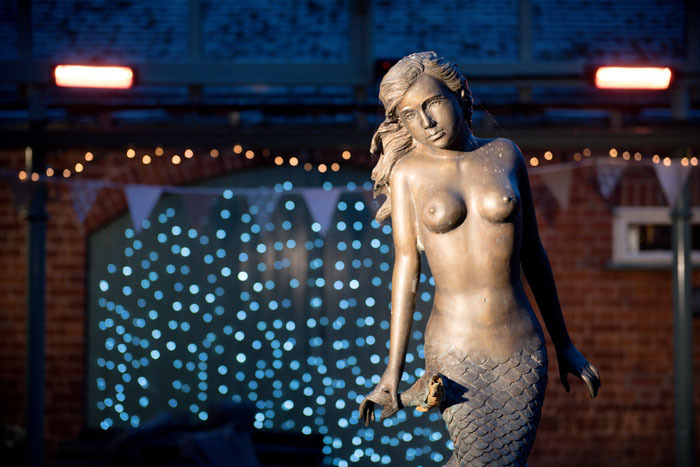 We had canapés, prosecco and craft IPA out in the courtyard featuring some favourites such as chilli halloumi. For the reception we chose long tables so that the guests sat close together. 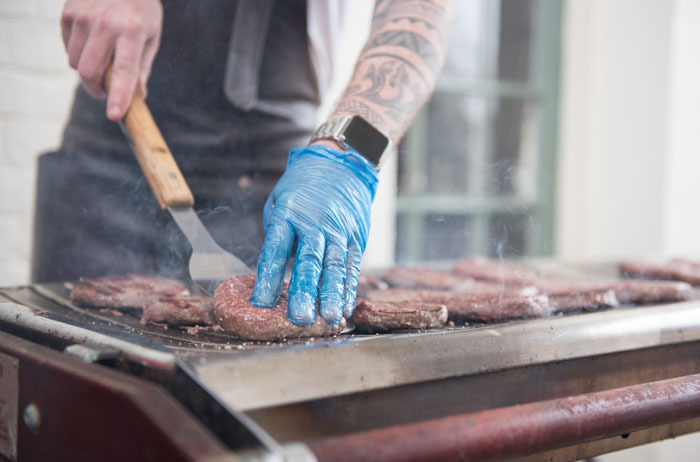 We had the first barbecue of the year featuring local Shropshire produce and this ensured that the guests could be up and out of their seats. Dessert was slightly more formal in that it was plated to bring everyone back together for speeches, but featured a trio of our favourite desserts. 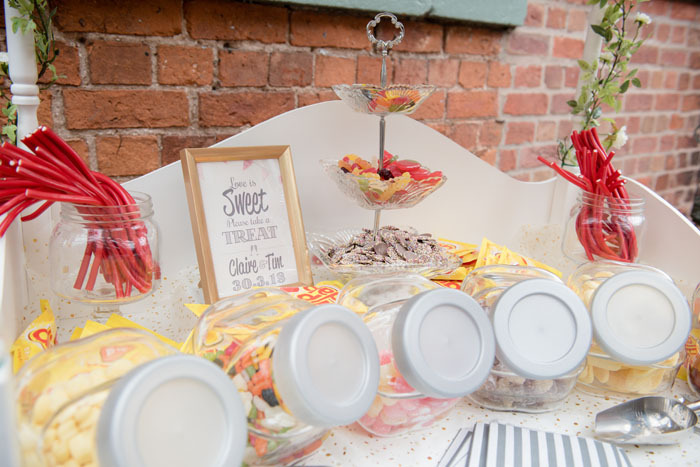 Tim loves his technology so the magic mirror photo booth was an absolute must and proved to be really popular as was the sweet card which featured our favourite childhood sweets, including Dip Dabs and bonbons. Needless to say we all had an absolute blast. 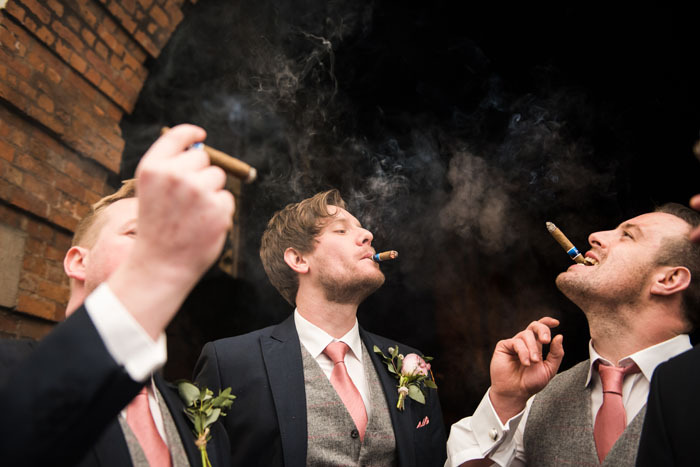 The photographer even got a shot of the men smoking a wedding cigar. 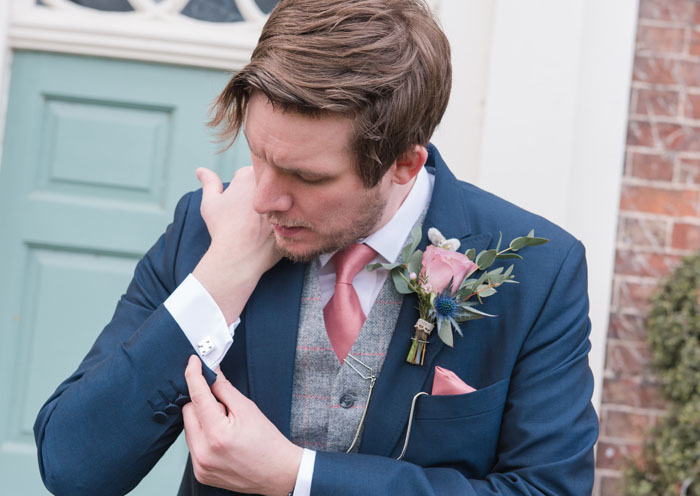 After having been calm all morning, I was extremely nervous right before I walked down the aisle. Talking to the registrar beforehand seemed to take forever. 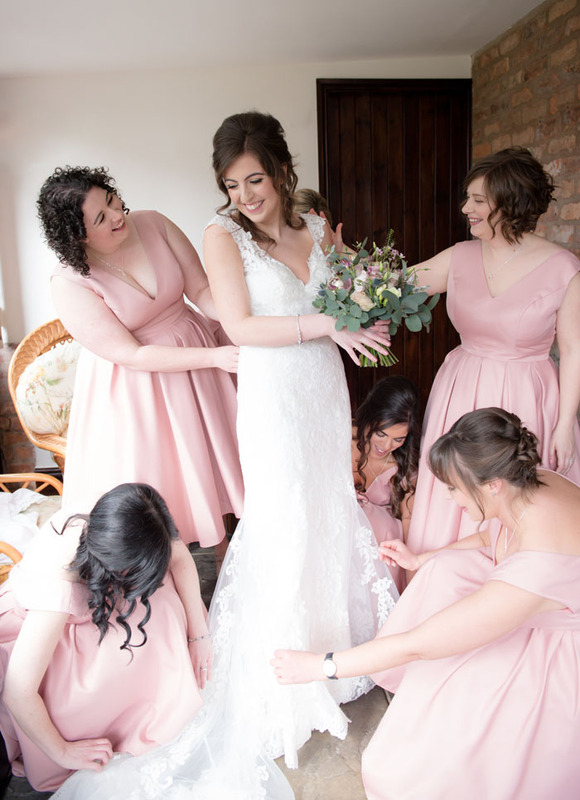 Just as my bridesmaids were about to walk in to the ceremony room I had the strangest urge to burst into tears... needless to say, I was absolutely fine. We spent a long time choosing all the music for the ceremony. 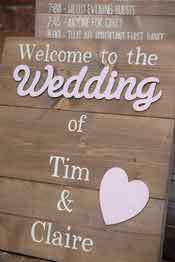 One of the most personal touches was that Tim actually walked down the aisle too. 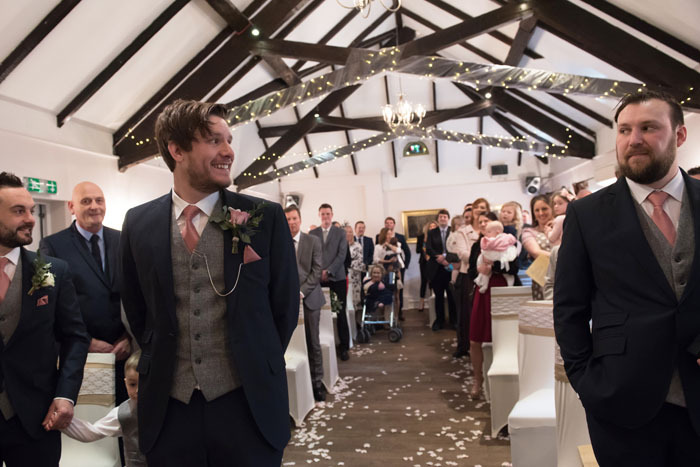 He strutted down the aisle to James Brown’s The Boss and this was followed by a rendition of The Beatles' Help while he was waiting for me, which got everybody laughing. Claire walked to A Thousand Years and we signed the register to the upbeat You Make My Dreams by Daryl Hall and John Oates. 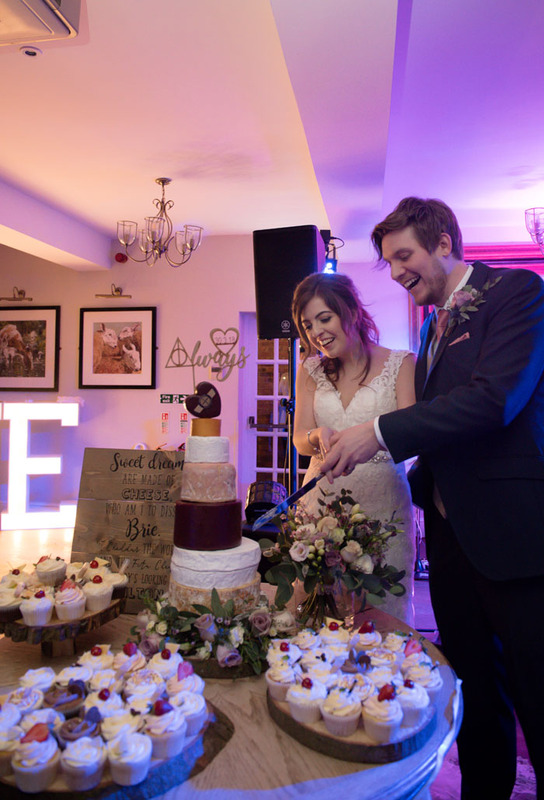 For the ceremony, candles and fairy lights were lit and the main lights set low to give an intimate feeling. Three of our best friends did the readings for us: a philosophical reading about soulmates and then a funny poem about marriage itself. This is such a difficult question as there were so many with so many different people. 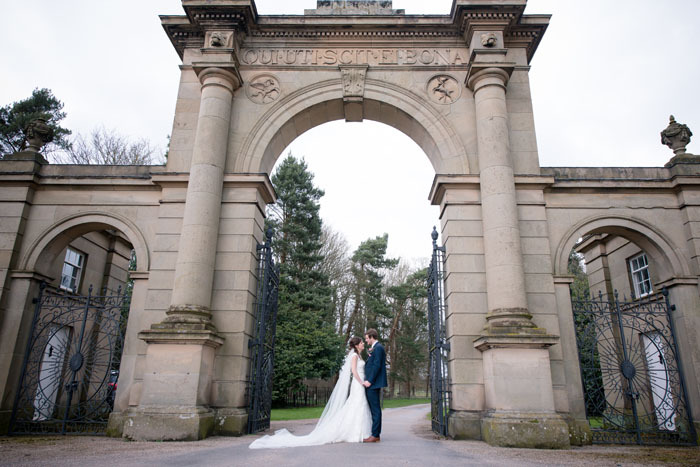 One of our most memorable moments on the day was crossing the road to have a photograph taken by the gates to Attingham Park. We actually stopped the traffic; cars beeped their horns and well wishers waved out of their window and made us feel so special while Tim helped me carry the veil across the road. 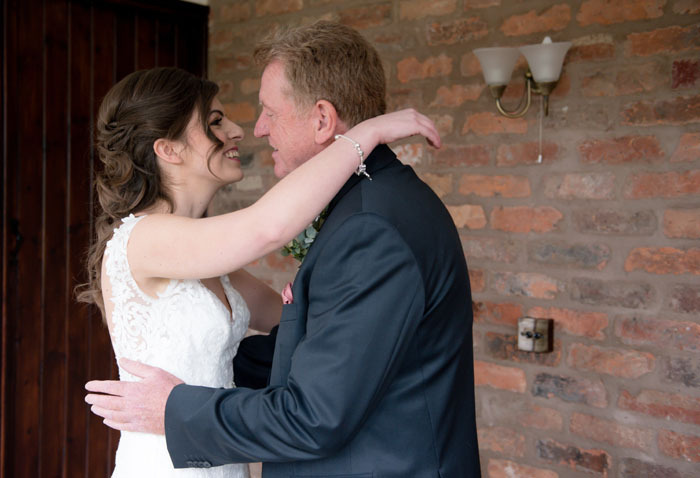 What was also special about this moment is that for the first time since being married, it was just us and the photographer so we were grateful for those few special moments alone. 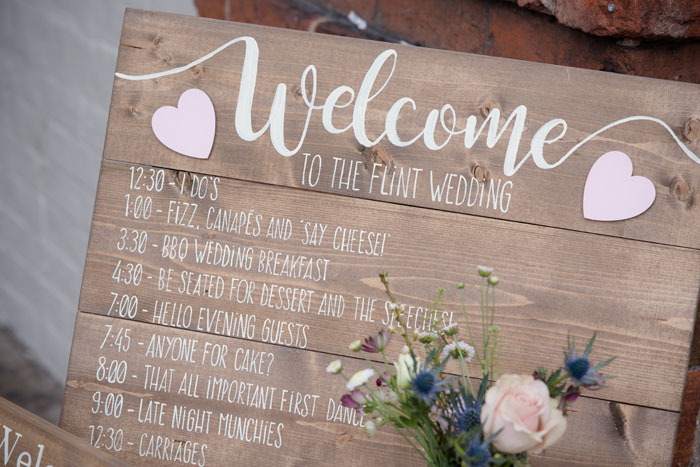 It might seem ridiculous, but one of the most challenging aspects of planning the wedding was trying not to talk to each other about the wedding all the time. In the last couple of months before the wedding it really took over. We would find ourselves having hour-long conversations after work about the tiniest details. It's like a second job. For us, our first and most important investment was the photographer. 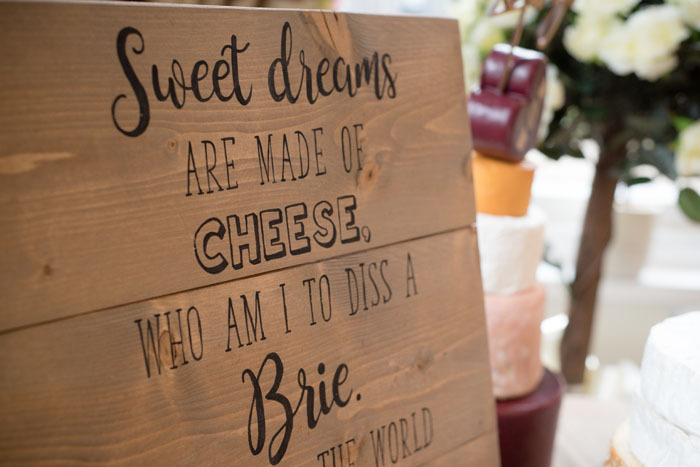 We wanted to be sure to choose the right person to capture our day. 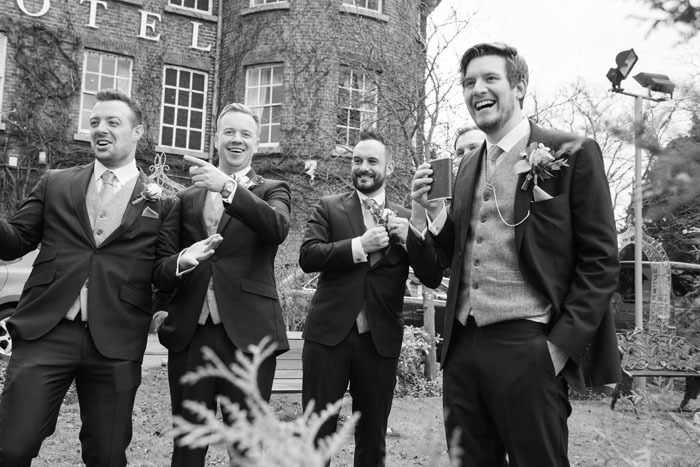 We wanted a photographer that made us feel relaxed and shared our vision for the day. 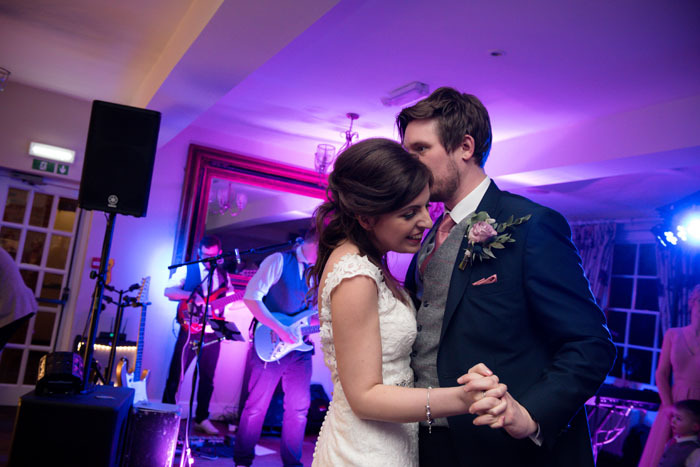 In the evening we had a live band called The Spectrum who played our first dance. We choose the '80’s classic Only You by Yazoo and then mixed it into Shut Up and Dance With Me to get everybody up on their feet. Our cake was amazing; it was seven layers of cheese and our cake topper was cut from wood and featured a simple quote about love from one of our favourite Harry Potter stories. 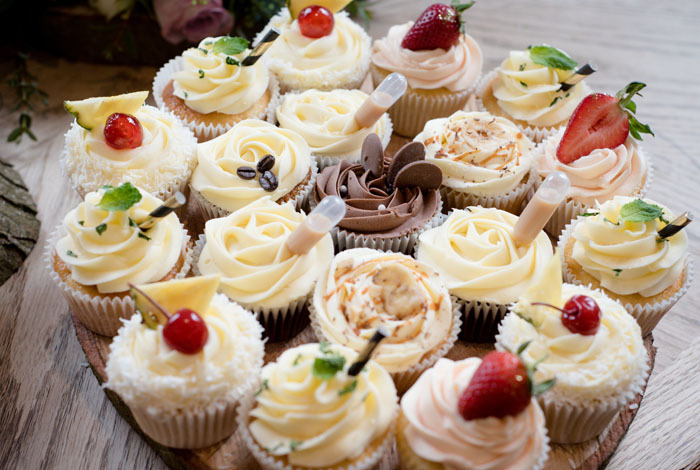 As a special treat for those that might miss the cake we also had boozy cupcakes that were themed on our favourite cocktails and drinks such as Pina Colada, espresso martini and of course, gin and tonic. We’d try and make ourselves more hungry. All that time choosing food and we barely ate anything ourselves. We would also take our GoPro camera along to capture the day from our point of view. This had been the original plan but we completely forgot to charge the camera the day before the wedding. We can honestly say that everything went like clockwork. 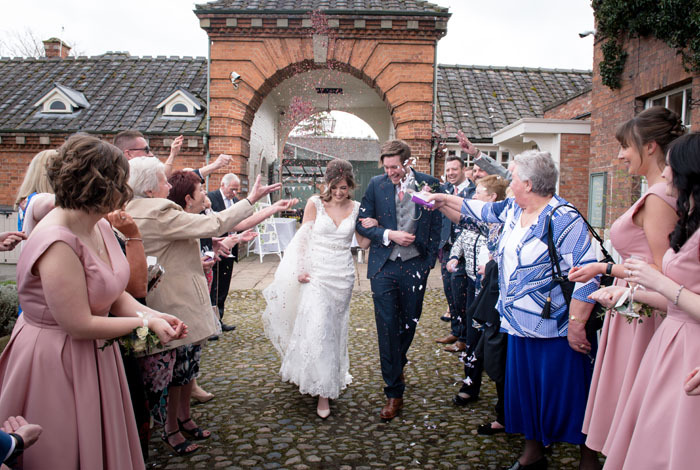 We had rain during the evening reception and a few puddles had formed in the courtyard that I managed to walk through, resulting in a grubby looking dress at the end of the wedding... but we can live with that. Yes, I didn’t know that you wear your wedding ring under your engagement ring, so I would have taken that off before the ceremony rather than in the middle of the ceremony. 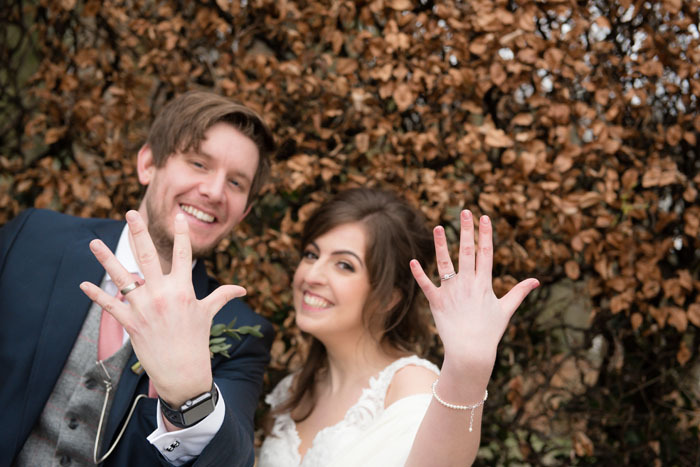 We were married on a Friday and went on honeymoon the following Monday. We spent most of the weekend packing as we hadn’t had time to do it before. We went to Riviera Maya in Mexico. It was amazing and relaxing, just what we needed after the wedding. Lists, lists, lists. Make a list of everything that you want and then prioritise it with the most important things at the top. This helps to manage the budget. That way you get everything you need and then, if the budget allows, you can treat yourself to the things at the end of the list. 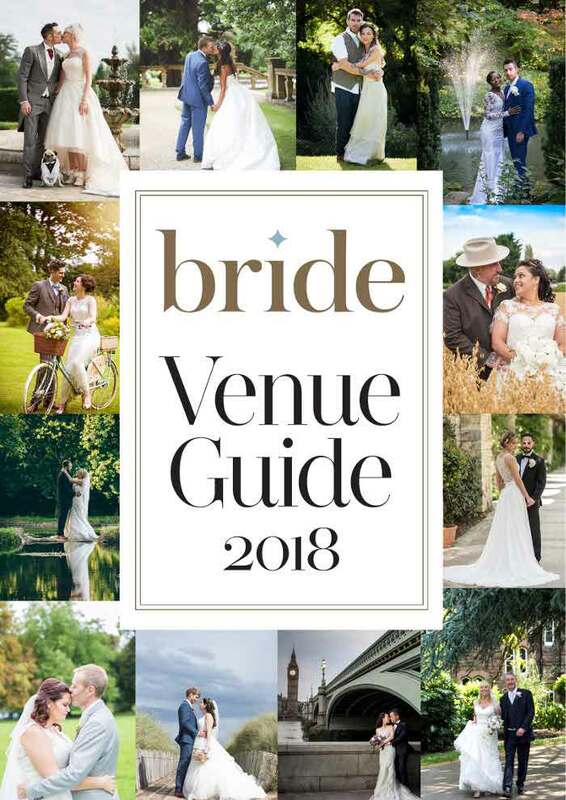 Our most valuable investment for the wedding were the suppliers; they may seem like an added expense at the planning stage but we are so glad that we spent the money on a good photographer, make-up artist, florist, hairdresser etc. 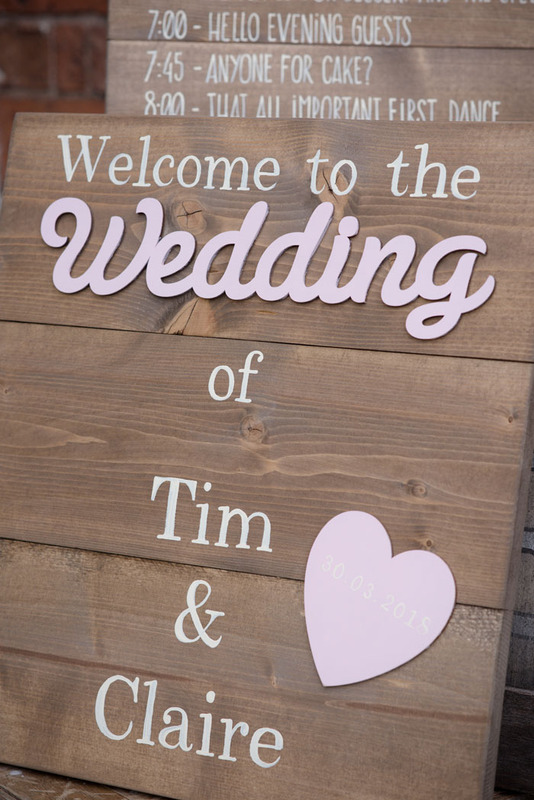 They helped the day run smoothly and allowed us to focus on other details. 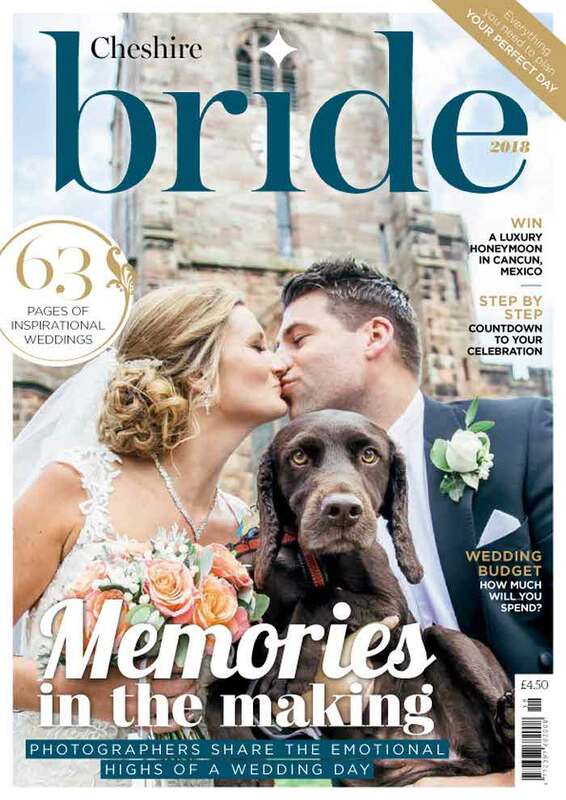 For more real wedding inspiration, pick up the latest issue of Bride magazine.